Samuel Hoffman | The Journal Gazette New Haven running back NiShawn Jones raises five fingers in tribute to slain 14-year-old Nicholaus Scroggins. Courtesy Area athletes are paying tribute to Nicholaus Scroggins, 14, who was slain in June. Auston Robertson, a 2016 Wayne High School graduate and defensive end for Michigan State University, couldn’t get jersey No. 5 so he chose 94, because 9 − 4 = 5. 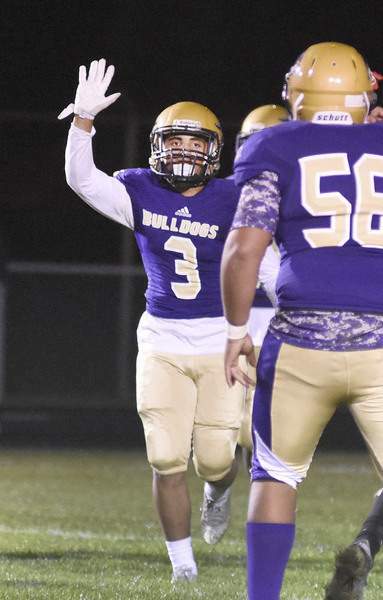 NiShawn Jones, senior running back for the New Haven Bulldogs, raised his right hand to show five fingers when he scored a touchdown or made a big play. But it wasn’t a high-five. It had another significance. These athletes and others from Fort Wayne are honoring a No. 5 who will never play again. 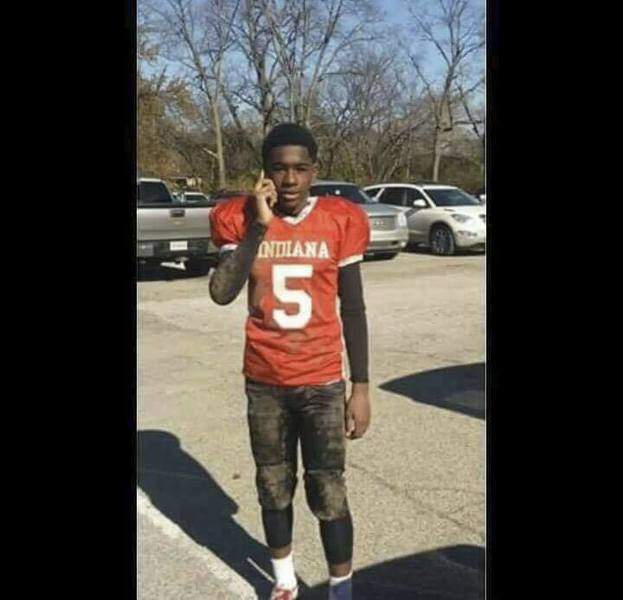 Nicholaus Scroggins, who this summer became Allen County’s 15th homicide victim of the year, wore that number when he played football for Fort Wayne’s Metro Youth Sports and Team Indiana, a statewide football league. Scroggins would have been No. 5 at Miami Middle School except the number was already taken, so he was No. 6. His life was cut short June 21 when he answered a knock at his door on Fairfax Street around 4 a.m. Shortly after, he was gunned down in the 5200 block of Lillie Street. His mother, Tennille Walker-Bright, was asleep upstairs. The autopsy report indicated 57 shots were fired, though even his mother doesn’t know how many bullets struck him. No arrests have been made. Scroggins, known as Li’l Nick, Sweet Feet and "the city’s little bro," was 14. Jones is credited with starting the "5" movement in August during the second game of the season at Lakeland High School in LaGrange. "I was running down the field, about to score an 80-yard touchdown," Jones recalled. "I was about 10 yards away. I just started holding my hand up before I even got to the touchdown." Scroggins was like a little brother to Jones, who is a best friend of Scroggins’ older brother, Immanuel Walker. Their friendship formed at Miami Middle School where both played basketball and ran track. "He always wanted to be with the older guys," Jones said of Scroggins. "He had an old soul. He was always around us." The night Scroggins was killed, Jones was at the Walker-Scroggins home upstairs hanging out with Scroggins’ older brothers, he said. Robertson, who lived with the family for about six months, was also at the home the night Scroggins was killed but left earlier. "Somebody Snapchatted me," Robertson said, "with ‘hey, what happened to Little Nick?’ "
Robertson heard from Scroggins’ older brother 20 or 30 minutes later. He asked him to come to the hospital where Scroggins was undergoing surgery. "We ended up going to the wrong hospital," Robertson said. "By the time I got there, it was too late." Robertson hopes the local athletes who are changing their uniform numbers and throwing up fives will have an effect on the street. Fort Wayne has had 44 homicides this year, many of them in the 46806 ZIP code where Scroggins and his family lived. "I see a lot of kids walking around with a shirt with No. 5," he added. "I think the parents may be more aware of who their kids are hanging around, more involved in their child’s social life," Robertson said. But he understands there are a lot of single mothers who work and can’t be with their teenage children. For that, he said local organizations could help out. That could mean more after-school programs and child-care opportunities. South Side High School sophomore Everitt Merrit, who played wide receiver this fall, said his coach understood when he asked for No. 5. Merritt said he asks himself "what if my parent was in that situation?" Ever since that night, he’s careful with curfew. "Before I wasn’t," he said. Merritt believes it’s going to take better parenting, a unified community and more police involvement with the residents to stop the homicides. Nasim Khan, Scroggins’ aunt, has been tracking the No. 5 phenomenon. She’s found football players from Wayne, New Haven, South Side, Lawrence Central in Indianapolis, Bishop Luers and Miami Middle School getting their numbers changed or holding up five fingers. Team Indiana played recently and brought out Scroggins’ jersey before the game. Ty Curry, offensive line coach at New Haven and a coach for Metro Youth Sports, believes the homage is unique. "A lot of players have caught on with it in the SAC," he said, referring to the Summit Athletic Conference. At one game, a referee thought Jones was taunting another player when put up his hand, Curry said. Once the gesture was explained, the referee understood. "Any chance I get to score. Or if I make a big play on defense, I put up the five high," said Diamond Towns, a senior who played safety for New Haven. "Nick was like my brother. He was like everybody’s little brother. I loved him. I still do," Towns said. Fort Wayne-produced and recorded rap videos have surfaced since Scroggins’ death. "RIP Lil Nick" was recorded by artist Jason Ash who goes by the name Ash Wit It. Walker-Bright appreciates the tributes. "It just shows me how good of a kid he was," she said. "They say everything happens for a reason. He was only 14 years old. And for him to have the impact on the city he has, it shows me that he didn’t die in vain."